Pacific Ethanol crushed the market last year. Should investors expect a repeat performance in 2017? There's no denying it: Pacific Ethanol (NASDAQ:PEIX) had an amazing year in 2016. The stock had brief periods of volatility, but managed to forge its way to gains of nearly 99% -- the third-best annual return since it began trading in 2004. The market handed shareholders a decisive victory and put the bears to shame. Several catalysts were responsible for driving Pacific Ethanol's stock higher, but, believe it or not, the gains merely mean the company now trades at book value. That alone should keep investors from expecting an encore performance in 2017, but uncertainty surrounding upcoming debt payments could prove to be the biggest single event in the year ahead. While state and federal subsidies have played an important role in the industry in the last decade, by now investors realize that ethanol is a commodity. That means producers churn out profits by supplying large volumes and keeping costs low. Pacific Ethanol did both in 2016. The enormous acquisition of Aventine Energy in mid-2015 boosted the company's annual production capacity to 515 million gallons and annual marketing capacity to 800 million gallons (including storage), making it the sixth-largest ethanol producer in the nation. 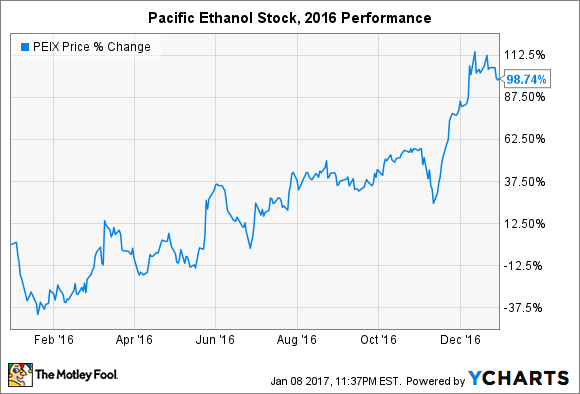 Through the first nine months of 2016, Pacific Ethanol sold 40% more gallons than during the year-ago period. During the same period, revenue grew 45% and cost of goods sold grew just 42%, allowing the company to report a gross profit of $25 million during the first three quarters of last year. In other words, the company's huge bet on Aventine appears to have paid off so far. The acquisition's impact stretches beyond the financials. Pacific Ethanol's legacy production facilities are situated on and near the West Coast. The western-biased fleet allowed it to service more valuable markets in California, but also kept it from larger opportunities in the Midwest and Northeast. Aventine changed that by adding major facilities smack dab in the Corn Belt. The new strategic advantage should allow shareholders to take part in more diverse market opportunities in the years to come. It will be interesting to see if geographic diversity compounds the value from the company's strategic investments in by-products. All corn ethanol producers extract fermentable sugars from corn, then sell the remaining by-products to animal feed and other markets. Pacific Ethanol, which specializes in corn oil, generated $189 million in sales from by-products in the first nine months of 2016 -- up 63% from the year-ago period. That provides a significant offset to input costs. It could get better: The company became the first producer in the nation to deploy a new process that converts corn oil into higher-value, next-generation ethanol. Management plans to roll out the technology at several more production facilities soon. Investors should expect further updates to this exciting value-creating opportunity in 2017. Barring any wild price swings in the ethanol or subsidy market -- which, admittedly, aren't out of the question -- there's good reason to think Pacific Ethanol can continue to improve its production numbers. The year-over-year growth won't match that from last year, but production volumes and costs both have room to improve. The company's utilization rate was 92% in the first nine months of 2016 -- markedly better than 85% in all of 2015 -- but could realistically head closer to 95%. Several percentage points could be a difference of 15 million gallons of production and help to lower production costs, too. Overall, production growth and optimization is heading in the right direction. Therefore, I would suggest investors pay closer attention to the company's balance sheet in 2017. At the end of September 2016, Pacific Ethanol had $216 million in long-term debt. That's not a worrisome number in itself, but $153 million was listed as current debt, or the amount coming due in the next 12 months. How the company chooses to handle the upcoming due dates will play a major role in the stock's direction this year. Management could issue new shares, but the current portion of debt represents 40% of the company's market cap. That would be an uncomfortable amount of dilution. The company could also restructure the debt. Given recent operational improvements, it would likely be able to wrestle more favorable terms and lower interest rates out of creditors. That wouldn't be a bad option, especially considering that Pacific Ethanol's interest expense ($16.6 million) was larger than its net loss ($12.6 million) through the first nine months of 2016. In other words, it would have posted positive EPS without interest payments. The company could elect to issue new shares or refinance, or a combination of both. Either way, paying off the current portion of the long-term debt represents the single biggest event on the company's radar heading into 2017. Why Is No One Talking About Pacific Ethanol Stock?